Have you ever had a problem with mold in your home or commercial property? Have you ever had a problem with mold in your home or commercial property? If you have, you know that mold can spread quickly and be very troublesome to get rid of. One of the quickest ways mold can spread is through your HVAC system. If mold gets into your HVAC, it can be circulated throughout your property. Follow these tips to help keep the mold out of your HVAC system. The coils inside your AC unit will develop condensation as a part of normal operation. There is a drainage pain underneath the coils that is supposed to carry the moisture out of the unit. The pain should be properly sloped so that the water can flow out, and the pan and coils should also be kept clean as part of your regular HVAC preventative maintenance. A humidifier or dehumidifier is a fantastic way to help control the humidity levels of your property and improve overall air quality. 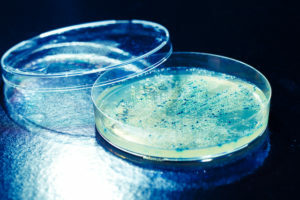 It is important to note, however, that if these types of units are not drained and cleaned regularly that mold spores and other microbes can develop easily. The ductwork of your HVAC system is the largest component of the entire system, and it is always in use. Some dust is bound to get in there at some point, but any more than a little and it needs to be cleaned out. Some areas may be more prone to condensation than others so make sure to pay special attention to those. Familiarize yourself with the location of the intake vent on your property. Make sure it’s nowhere near landscaping, standing water, or dumpsters. Mold thrives in these types of environments, and plants near the intake can also introduce extra pollen into the system which can clog your filters and cause allergic reactions. This entry was posted on Friday, January 18th, 2019 at 2:37 pm. Both comments and pings are currently closed.